Lesser, Lesser, Landy & Smith has been regionally ranked in two categories by U.S. News & World Report Best Lawyers “Best Law Firms” for the 9th year in a row. The Firm is ranked in Personal Injury Litigation and Insurance Law based on a rigorous evaluation process. 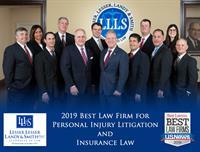 Lesser, Lesser, Landy & Smith is a third-generation law firm that has been representing injured clients and their families across the state of Florida for more than 91 years. In that time the Firm has grown to 12 attorneys with more than 275 years of combined experience. They have four offices located in West Palm Beach, Stuart, Wellington, and Boca Raton.